You've planned your vacation to North Myrtle Beach and your itinerary is almost full. Beach? Check. Waterpark? Check. Shopping? Check. Parasailing? Check. But there's a night that needs to be filled, and with as many awesome choices, it can be tough to decide. 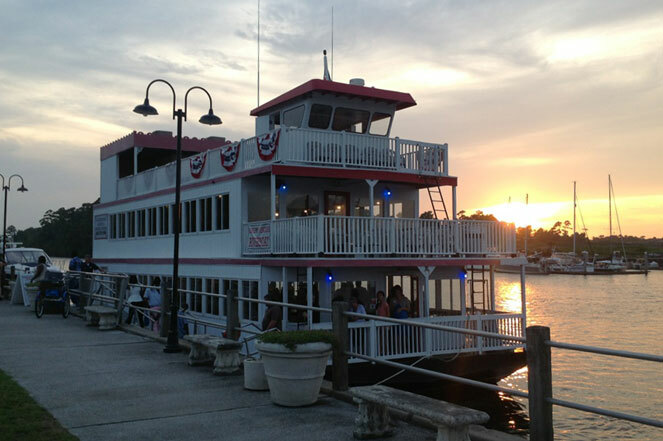 A great suggestion and a truly unique experience is waiting at the Barefoot Landing Marina with a sightseeing, sunset or dinner cruise aboard the Barefoot Princess riverboat! Standing alone as the only riverboat tour available along the Intracoastal Waterway, the Barefoot Princess offers guests a scenic and memorable excursion. Spanning over 60 feet long and featuring three levels, the Barefoot Princess can accommodate up to 130 passengers. The lower level offers a dining room for the dinner cruises, while the second floor has a dance floor, snack bar, an observation deck and features entertainment and narration of the tour. Both these levels are climate controlled, while the third level offers comfortable open-air seating. The cruise directors recommend purchasing tickets in advance, as they often sell out quickly. There are also special event cruises that can be requested like graduation parties, reunions, corporate events and proms. For more information and to purchase advance tickets, check out the Barefoot Princess Riverboat website. Make sure to check it out while staying in one of our fantastic Barefoot Resort properties!